Deciding where to live is a tough process with many factors involved. How long will your commute be? What are the schools like? Is my neighborhood safe? Safety and crime levels are a key factor in choosing where to live. The safety of your neighborhood will impact how much time you spend outdoors, if you feel safe at night, and whether you choose to let your children play outside. We have covered reviewing the FBI crime statistics for Bay Area cities, but another way to examine the safety of a specific neighborhood is to review crime maps. A neighborhood crime map will help you spot exactly where crimes are being committed in your city, and what the crimes are. 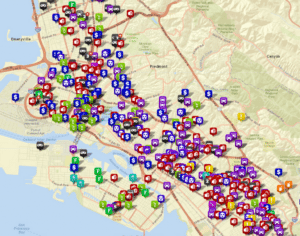 For this blog, we are using CrimeMapping to review the crimes in various Bay Area cities. 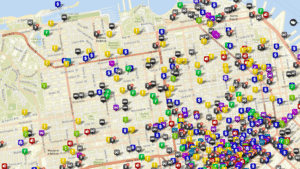 If you have decided to live in a specific city, like San Francisco, you can pull up a San Francisco crime map to help you choose which neighborhood to live in. If you have not picked a specific city, but know the general area you want to live in, can study a regional crime map. 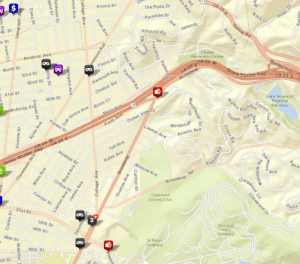 For example, if you know you want to live in the East Bay, you can look at an East Bay crime map to help you choose a safe city for your next home. While not every city is represented on CrimeMapping, you can get a basic idea of the number and types of crimes and even change the date ranges. In the Bay Area, many people think of a specific city like Richmond or Oakland as being more crime ridden or dangerous. While a city has a certain overall crime rate, most crime is clustered in specific areas. Using the Oakland crime map below as an example, you can see that some areas have a lot of crime, and some areas have almost no crime. Crime maps can help you make the best safety decisions for your family. Perhaps you are not so concerned about DUI cases, but would like to avoid areas with robbery because your elderly mother likes to take walks around the neighborhood. Being informed about the various types of property crimes in your potential neighborhood will help you make the right decision about where to move. Crime data can also help you make informed decisions about the type of security system you choose to protect your home. If your neighborhood has some vandalism, you might choose to install outdoor surveillance cameras to deter graffiti. No matter which neighborhood you pick, adopting a home security system has been shown to lower your chances of burglary. No matter which neighborhood you choose, All-Guard Alarm Systems is here to help you pick the right security system to protect your family, your home, or your business.